Tag Archive | "Troy Vermeulen"
Troy and Jenni Vermeulen and Myrna and Bruce Chapman pose with The POST. 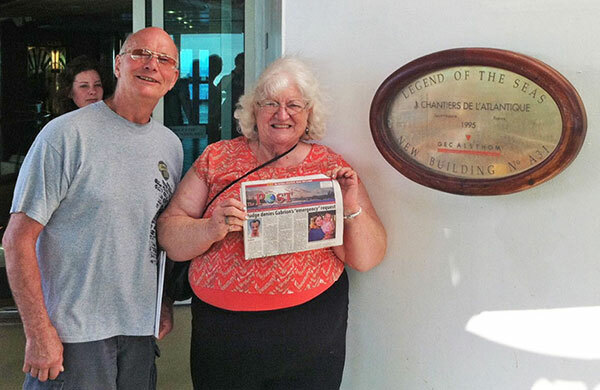 Bruce and Myrna Chapman pose with The Post aboard the Legend of the Seas. The Post recently visited the South Caribbean with Bruce and Myrna Chapman, of Sand Lake, their grandsons Troy Vermeulen and his wife Jenni, of Greenville, and Rich Chapman, formerly of Cedar Springs. They went on a 10-night South Caribbean cruise aboard the Legend of the Seas, a Royal Caribbean cruise ship. They boarded the ship on February 27 at Ft. Lauderdale, Florida and sailed to Charlotte Amalie, St. Thomas; Basseterre, St. Kitts; Roseau, Dominica; St. Johns, Antigua; and Philipsburg, St. Maarten, and returned to Ft. Lauderdale on March 9, 2015. 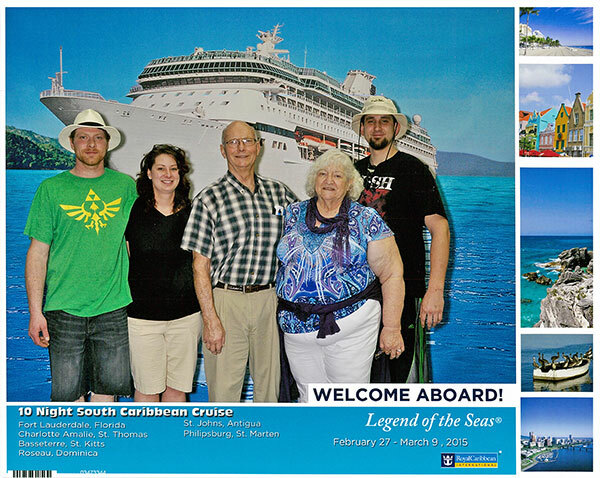 Troy and Jenni Vermeulen, Bruce and Myrna Chapman, and Rich Chapman pose for a pic as they board the Legend of the Seas cruise ship. This was Bruce and Myrna’s 30th cruise. They went on their first cruise in February of 1986 for their 25th anniversary and have taken a cruise once a year ever since, except for one year they went twice! 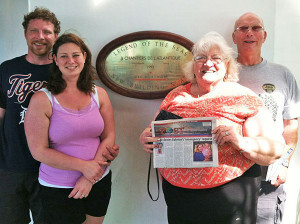 They are experienced cruisers and enjoyed having some of their adult grandchildren join them this year. In 1998 they took a big group of their family (children, spouses, grandchildren) that were able to go on a 7-day cruise to the western Caribbean. Troy and Rich were just tweens then, so it was fun for them to go on another cruise as adults. Troy and Rich played volleyball in the pool on the ship and were reigning champions. They went cliff diving at Ti Tou Gorge in Dominica (where scenes from Pirates of the Caribbean Dead Man’s Chest were filmed). They also entered the sexiest man on the ship contest, Troy won the contest and gained the nickname “Shaggy,” making him a celebrity on the ship. Bruce and Myrna enjoyed these special moments with their grandchildren and the Post was there with them. Thanks to the Chapmans for taking us with you on your many adventures!